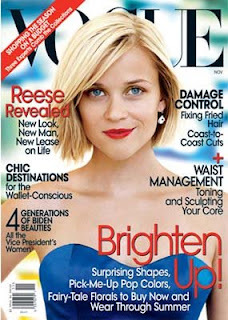 Reese Witherspoon is on the cover of Vogue for November (for the third time, btw), because she has a new look and a new man which means she has a new lease on life, as opposed to last time she was on the cover of Vogue where she was just renting her life and she had an old look. Whatever. I'm only writing about it because the spread features Olivier Theyskens and I love him and I don't even care that he always pals around with the blondies (Lauren Santo Domingo is his other bff). The weird thing is that whenever she was on the cover of Bazaar last year (she had just gotten divorced, so clearly we needed to know how she was doing! ), the article was all up on her and Olivier's friendship and how she like, totally RECOMMENDED him for his position at Nina Ricci and whatnot. So Olivier is Reese's link into the fashion world and I'm sure we'll keep hearing about their budding romance in years to come. I still love that Olivier, crazy rascal. that red dress is amazing.. i want?